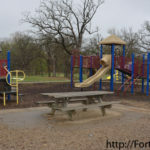 With the arrival of spring and even warmer months to come, the city of Fort Scott encourages residents and visitors to take advantage of the amenities provided at Gunn Park. 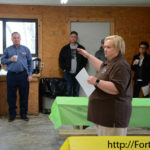 “What an awesome park we have here,” City Manager Dave Martin said during the Chamber Coffee Thursday morning, when codes enforcement manager Rhonda Dunn spoke of the history of the park. 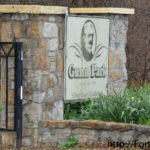 Dunn said she has heard that Gunn Park is the largest, city-owned park in the state of Kansas, with 155 acres that include two lakes, seven shelter houses, a number of playgrounds, a disc golf course, dog park, trails and the Marmatton River. 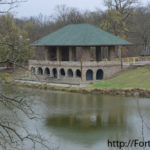 In the early 1900s, Gunn Park was privately owned land and only Fern Lake existed, with a wooden pavilion building and the remainder of the current park property being used as farmland. 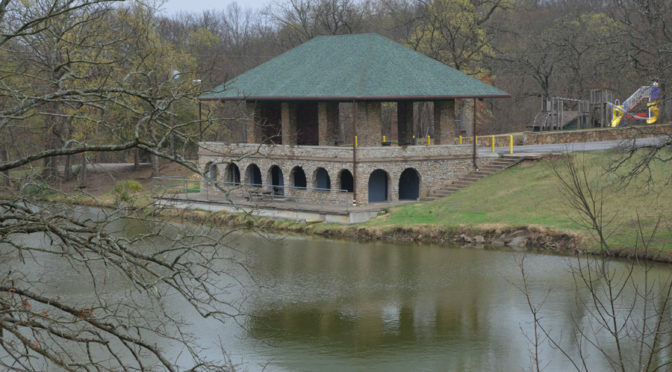 According to records, the park was frequently used by the community who came for swimming, diving, boat rentals and five cent trolley rides. 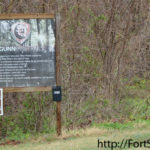 William Gunn, who found success in real estate and invested greatly in Fort Scott in the early 1900s, purchased the land and gave it to the city, with records quoting him as saying he believed the park should belong to the city and should always be free to visitors. “We are the benefactors of an incredible gift,” Dunn said of Gunn’s gift more than a century ago. 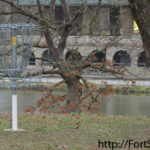 Since accepting that gift, the city has maintained the park as well as made a number of changes. 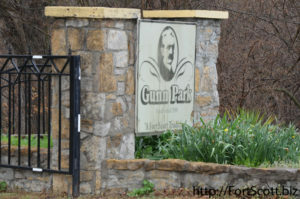 Dunn encourages businesses and residents to consider Gunn Park when planning for events such as parties or family reunions, adding she would like to see the community present at the park more frequently. 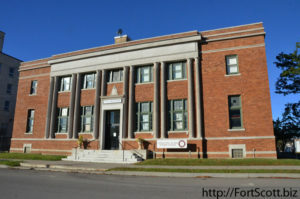 Those interested in reserving one of the shelter houses, two of which now have heating and air, can contact city hall. No matter how squeamish you are, I recommend you see the movie “Hacksaw Ridge.” Even though the war scenes are graphically gruesome—I closed my eyes—the message to rely on God far exceeds any blood-and-guts cinematography. If ever someone’s Christian convictions dictated his decisions, it was Desmond Doss’s. In the opening scene, Doss is reading aloud from Isaiah 40:31: But they who wait for the Lord shall renew their strength; they shall mount up with wings like eagles; they shall run and not be weary; they shall walk and not faint. That verse becomes his life refrain. After joining the army to work as a medic in Okinawa during the bloodiest battle of WWII, Doss relentlessly defends his belief not to shoot a gun, kill the enemy or work on the Sabbath. (Hard to do in war, and especially difficult to convince your army buddies you deserve to serve alongside them.) Doss’s bunkmates despise him. As they practice their sharp-shooting skills, he reads his Bible. In their eyes, they are asked to protect a young, skinny medic who refuses to carry his fair load. Because of that, Doss is beaten, persecuted and charged with “mental instability.” After arguing for his First Amendment rights—the freedom “to be like Christ: saving life instead of taking it”—he wins his court martial case and is allowed to go into battle. Only when he is in a foxhole with Smitty, the soldier who led the bunkhouse assault against him, does Doss reveal why he abhors violence: as an adolescent, he had pulled a gun on his alcoholic father who was beating his mother. The foxhole partners soon realize they have many things in common. As a friendship is formed, the Japanese attack. In the ensuing battle, Smitty is killed. The American soldiers are forced to abandon the area, leaving their wounded behind. Doss desperately pleads with God. “What do you want of me? I don’t understand! I can’t hear you!” At that moment, Doss hears a cry from a wounded soldier. His answer has come. Doss stands, says “Alright,” straps on his helmet, and as his fellow soldiers retreat, walks back into battle. Alone. That scene plays out multiple times as Doss begs God to allow him to save “just one more.” Each time, as an injured fighter cries out, Doss belly crawls to follow the voice of the wounded. Exposing himself to heavy gun and mortar fire, he drags severely injured men to the edge of the ridge, ties a rope around their bodies and lowers them to the waiting medics below. Because of Doss’s bravery and faith in God, he is able, over a twelve-hour period, to save 75 wounded comrades. This courageous action and others earn Doss America’s highest military award, the Medal of Honor, the first ever given to a conscientious objector. Doss had begged for an audible voice from God; instead, he received his answer amidst the cries of the desperate people around him. So what are we to take from this? If we want to hear God’s voice, maybe it’s as simple as paying attention. To our neighbors. Our friends. Our families. Our enemies. Just like God called Doss to do the impossible, perhaps he wants the same from us. The question remains: Are we interested enough to listen? 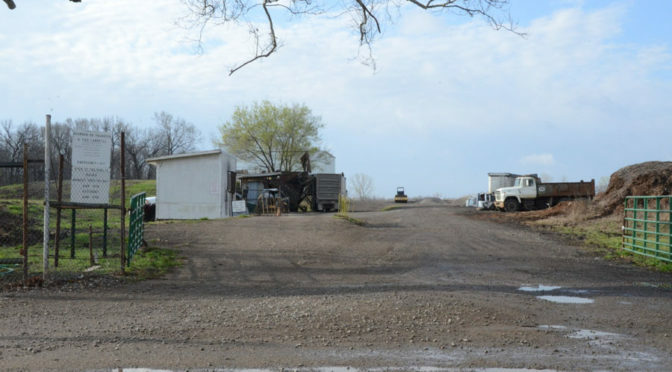 During the Fort Scott City Commission meeting Tuesday evening, the commissioners agreed to create a redevelopment district at the former Woods building, allowing developers to move forward with their plans for the structure. Economic Development Director Rachel Pruitt said she has been working to bring in a grocery store and is now working on a deal with Queen’s Price Chopper, a family business since 1974 that has five other locations. Joel Riggs, real estate director for Associated Wholesale Grocers and part of Super Market Developers, said the groups involved are moving as quickly as possible in order to have the grocery and retail store open by November. 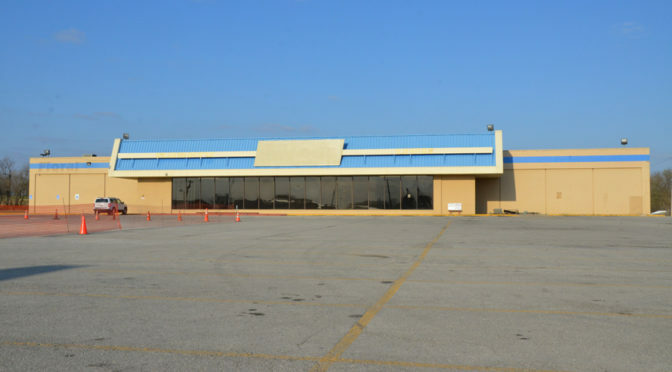 “This is kind of the first step in a pretty long process in moving forward to try to redevelop the property that was formerly Woods Grocery Store,” Riggs said, saying the physical redevelopment is scheduled to begin in July. With the city’s approval, a public hearing was set for the community to be involved and voice any concerns they have in the planning process. 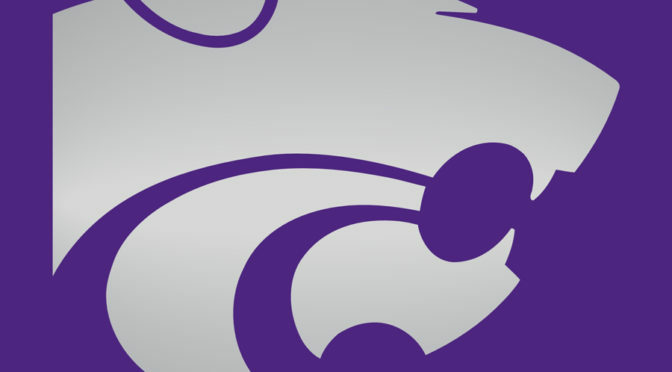 The first public hearing is set for May 2, with another to follow on June 20. Riggs said it is a complex financing plan, utilizing Tax Increment Financing bonds, a public financing method that could waive the impact of certain taxes on the zone for a period of time as an incentive. 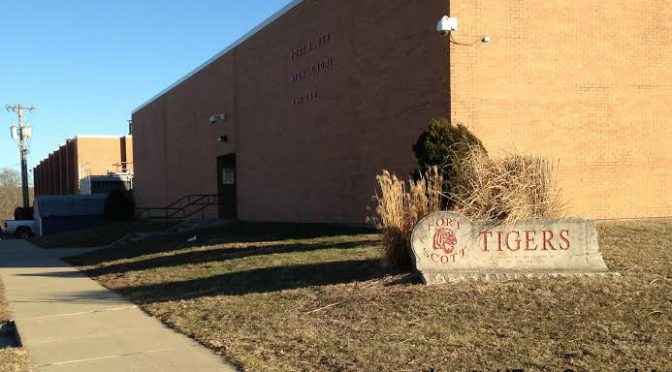 Pruitt said the city will be working with the county and Unified School District 234, as the three taxing entities must come to an agreement on the TIF Redevelopment District. Dr. Rick Kellenberger, owner of the Dairy Queen located near the Woods building, said they are looking forward to having new neighbors invested in that area. 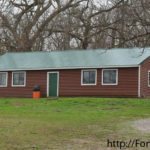 The city gave an update on Memorial Hall, with Pruitt saying they may be nearing a sales agreement with Last Farmhouse Films, Inc.
A representative from 4-State Sanitation said they will begin providing a drop-off point for recycling beginning on April 3. The commission gave their approval to allow alcohol sales during the Independence Day event to be held at the LaRoche Baseball Complex this summer. The Bourbon County Landfill is now accepting old tires as part of a tire program, allowing county residents to drop off the tires at no cost to them. 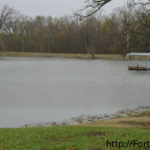 The program, whose goal is to clean up the county as well as remove potential breeding grounds for mosquitoes and the diseases they carry, will continue at the landfill through April 23, with specific weekends scheduled for other towns outside of Fort Scott. “It’s off and running,” Eric Bailey said of the program during Tuesday’s county commission meeting. Public Works Director Jim Harris said he believes they will be able to collect a number of tires, and said he hopes people get involved. Only passenger vehicle tires will be accepted and no more than seven tires at a time, except with a signed affidavit proving they are owned by the individual and not by any retailer or automotive business. The landfill will be open its normal hours, Monday through Friday from 8 a.m. to 4 p.m., and Saturdays from 8 a.m. to noon. Other collection points will be held on Saturdays from 8 a.m. to 11 a.m. at the fire stations in other communities including Bronson on April 1, Uniontown on April 8, Mapleton on April 22, Garland on April 29, Hiattville on May 6, and Redfield on May 13. 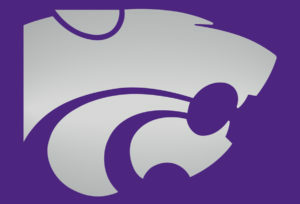 Fort Scott Community College will host a preview screening of the PBS American Experience film, “The Great War,” and a panel discussion April 10, 2-4 p.m., at the Ellis Family Fine Arts Center. The screening and discussion will follow the topic of “The War for Democracy: America’s New Foreign Policy,” looking into President Woodrow Wilson’s decision to move from neutrality to becoming a part of World War I. Panel members will include Pastor James Collins, retired army chaplain; Jan Elder (Baldwin), an emigrant from England whose grandfather served in World War I; and an FSCC faculty member who will be named later. See the press release below for details on the film that will air on PBS in April. 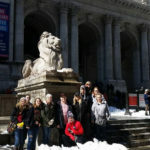 (BOSTON, MA) — Scheduled in conjunction with the 100th anniversary of America’s entry into the war on April 6, 1917, AMERICAN EXPERIENCE “The Great War,” a three-part, six-hour documentary, will premiere Monday, April 10, through Wednesday, April 12, 9-11 p.m. ET (check local listings) on PBS. Featuring the voices of Campbell Scott, Blythe Danner, Courtney Vance and others, “The Great War” is executive produced by Mark Samels and directed by award-winning filmmakers Stephen Ives, Amanda Pollak and Rob Rapley. Drawing on the latest scholarship, including unpublished diaries, memoirs and letters, “The Great War” tells the rich and complex story of World War I through the voices of nurses, journalists, aviators and the American troops who came to be known as “doughboys.” The series explores the experiences of African-American and Latino soldiers, suffragists, Native-American “code talkers” and others whose participation in the war to “make the world safe for democracy” has been largely forgotten. “The Great War” also explores how a brilliant PR man bolstered support for the war in a country hesitant to put lives on the line for a foreign conflict; how President Woodrow Wilson steered the nation through almost three years of neutrality, only to reluctantly lead America into the bloodiest conflict the world had ever seen, thereby transforming the United States into a dominant player on the international stage; and how the ardent patriotism and determination to support America’s crusade for liberty abroad led to one of the most oppressive crackdowns on civil liberties at home in American history. 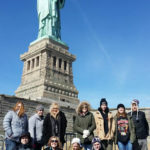 The broadcast of “The Great War” will be accompanied by a series of screening events and discussions hosted by universities, museums and public television stations around the country. “The Great War” will be available on DVD from PBS Distribution and can be purchased at ShopPBS.org. 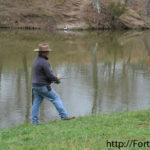 Online viewing begins April 11, at PBS.org. The email then moved from eggs to legs, comparing the design of the elephant, horse and cow. I read that, to rise from the ground, elephants’ four legs all bend forward, horses use their front legs and cows rely on the strength of their back legs. I wasn’t too sure how that proved the cleverness of God, especially after I watched a video of an elephant rising—his front ankles, not his knees, bending forward. However, the next part of the email fascinated me. It dealt with the numerical qualities of fruits and vegetables. Every Bunch of Bananas has on its lowest row an even number of bananas, and each row decreases by one. It just so happened that I was reading this email from the beach in Mexico. You know, where the waves roll in. So, I watched. And counted eighteen seconds elapsed between the first and second wave. Then sixteen. Do the math. There’s quite a difference between 26 and 3.5. It was time to research the truth of this email. Starting with eggs, the extensive list proved that not all egg-hatching is divisible by seven. For example, pigeons take 10-18 days and pheasants, 24 days. Then I checked out the fruit. Some watermelons, for example, have no stripes. As for the orange? Well, unless nine is an even number, this isn’t true, either. On Google, atheists had a field day with this information. Sadly, Christian enthusiasts, eager to validate intelligence in design, were passing on this fruitless data as if it were Gospel. Sermons were created from it. Facebook fanatics were copying it. Stop! Stop! I wanted to scream. God doesn’t need us to make up “facts” to support His cleverness in creation. We are surrounded by his work. Look at animals. Fruits and vegetables. The ocean. Human beings. All demonstrate the brilliance of One with a mind-blowing imagination. No extra addition is necessary. God. Is. Enough. And that, Readers, is my two cents worth. Revelation 4:11 reminds us of the attitude we should have towards God’s handiwork. 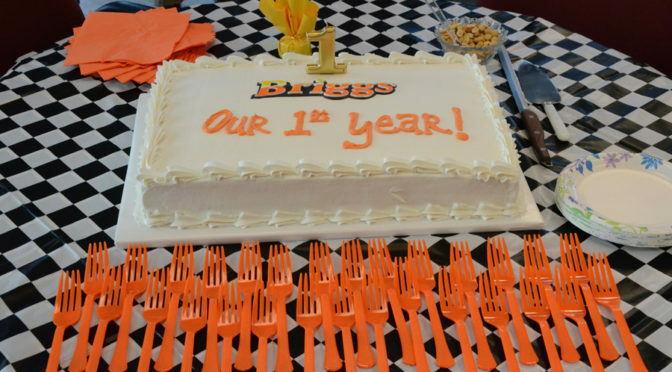 Briggs Auto Group celebrated its first year in Fort Scott during a Fort Scott Area Chamber of Commerce Chamber Coffee event Thursday morning, sharing accomplishments of the dealership as well as plans for the future. Already, the dealership has increased the number of vehicles in their fleet, expanding into a lot across Highway 69 from their location. 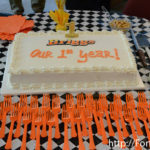 The company plans to continue its expansion be rebuilding some of the current buildings and making the lots more accessible to traffic. 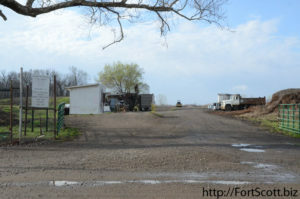 During the Fort Scott City Commission meeting to be held on April 4, the commissioners will discuss the redevelopment plans presented by Briggs, including a proposal that the stoplight to be installed at the S. National Avenue and Highway 69 intersection be a four-way stop instead of just three, allowing easier access to Briggs. 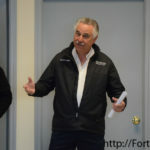 “It’s a big, major part of any community,” Briggs said of car dealerships, which not only provide vehicles to customers but also work closely with banks as they arrange financing. 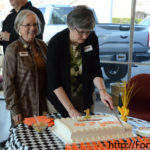 Briggs said Fort Scott’s is the only location of the company that sells vehicle models from Ford, Chevrolet and Toyota, but they are now able to sell them to customers at other locations via Fort Scott. 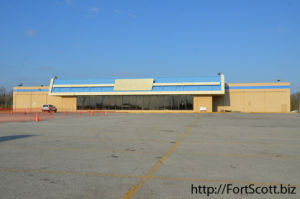 Though sold out of town, Fort Scott still receives the sales tax from those sales. 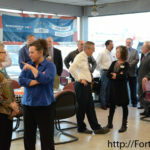 The company sells approximately 20-25 vehicles a month that Fort Scott benefits from, and the entire company makes about $400 million a year in sales. 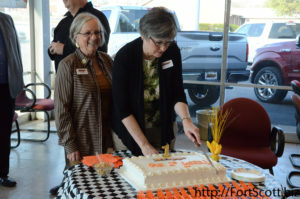 The Fort Scott location now provides a number of rental vehicles as well. Wildfire Relief Bill: HB 2387, an act concerning sales and compensating use tax; exemption for repairing, rebuilding or replacing certain property destroyed by wildfires. Tax: HB 2162, an act concerning sales taxation; relating to time for payment of tax. 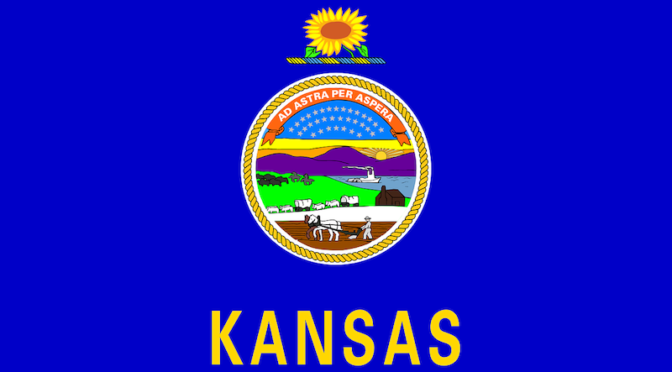 Ad Astra Rural Jobs Act: HB 2168, an act concerning rural economic development; enacting the ad astra rural jobs act. Health: SB 32, an act relating to mental health care; medical student and resident loan assistance; medical student loan agreements; practice commitment agreements; providing for agreements for the practice of psychiatry; establishing the psychiatry medical loan repayment fund and the rural health bridging psychiatry fund; concerning mental healthcare facilities. Campaign Finance: Sub HB 2223, an act concerning campaign finance reports for members of the legislature and reports by lobbyists; dealing with civil penalties for late filing of such reports. 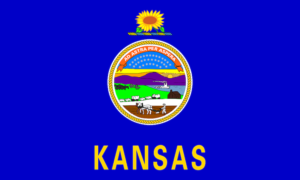 On Wednesday, the Kansas Supreme Court justices and the Kansas Court of Appeals judges appeared at the Capitol building to give the State of the Judiciary on the House floor. Chief Justice Lawton Nuss addressed both the House and Senate, speaking on the troubles facing the courts and their employees, raising awareness of the court’s proposal to raise their budget. This is the first time the Supreme Court has appeared at the Capitol to give the State of the Judiciary since 2012. Due to prior tension with a conservative-dominated legislature, the address has been held at the Judicial Center the last few years. The new House Speaker, Ron Ryckman, re-extended the invitation to the House floor this year. Legislative Update, Saturday, March 18, 9:30 a.m. at the Pittsburg Public Library. 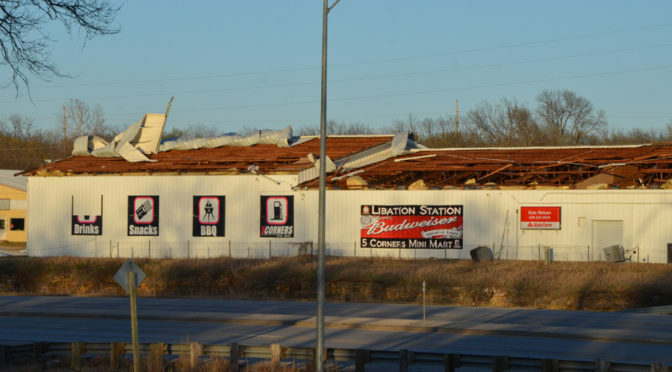 Area businesses continue to recover after recent storms brought high winds and even hail in the past month. 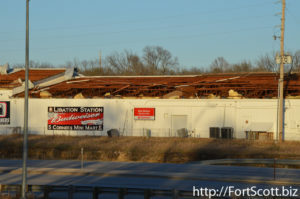 Stores located near Highway 69 off 12th Street suffered from damages as the roof blew off the building shared by Five Corners Mini Mart, Libation Station, State Farm insurance agent Kale Nelson’s office and The Shop car repair garage. Nelson is temporarily conducting his services from the second floor of Landmark National Bank while repairs are made to his office. The Five Corners gas station has remained open, but the Libation Station will close while repairs are made to the floors and ceiling. Briggs Auto Group is also providing discounts on vehicles as each of the cars on their lots received hail damage.